A handful of liberals are preparing to take on Donald Trump in 2020, though the pool of candidates leaves much to be desired, reports the New York Times. Leading the pack, at least according to the Times, is none other than Senator Elizabeth Warren of Massachusetts. While she hasn't announced a run for the White House, has been actively campaigning across the country ahead of midterms to help key Democrats in their races, while her emissaries have been reaching out to officeholders in Nevada, South Carolina and Iowa - three states in the presidential primary calendar. “I want a party strong enough to take on the hard job of cleaning up the mess they’ll leave behind once they are gone,” Ms. Warren declared, "all but volunteering for the task" as the Times puts it. Aside from Warren, 69, Former VP Joe Biden, Senators Cory Booker (NJ) and Kamala Harris (CA) have all been making the rounds along with Senator Bernie Sanders of Vermont - who has been "acting like a candidate as he considers another race." All five have been traveling the country, raising money for Democrats and gauging the appeal of their personalities and favorite themes. As a group, they are a strikingly heterogeneous array of rivals for Mr. Trump, embodying the Democratic Party’s options for defining itself: They are distinguished by gender and race, span three decades in age and traverse the ideological and tonal spectrum between combative Democratic socialism and consensus-minded incrementalism. Unfortunately for Democrats, none of these candidates really send a thrill up anyone's leg. Unlike the last few Democratic primaries, "the unsettled race evokes the sprawling nomination fights of earlier decades - lacking a dominant figure and seemingly inviting new leaders to rise," notes the Times. “The opportunity for somebody to emerge and catch a wave hasn’t been this high since 1976,” said veteran Democratic strategist Anita Dunn, referring to another unpredictable primary featuring a multitude of candidates as Democrats wrestle with their party's identity. Emphatic Uncertainty was the phrase used to describe interviews with nearly 50 lawmakers, consultants and party leaders, as senior Democrats see their party in an extraordinarily volatile state, while remaining weary of attempting another "Clinton-style coronation." Clinging to hope, many believe that the Democratic party's sharp left turn during recent elections has paved the way for progressive women such as Warren. Warren told Democrats in Salt Lake City recently that they had to close ranks in 2018 in order to recapture the White House. Perhaps most appealing to Democratic leaders, Ms. Warren might please their activist base while staving off a candidate they fear would lose the general election. Who's the second favorite to take on Trump, according to the Times? None other than 76-year-old Democratic Socialist Bernie Sanders - who has a huge following and a proven ability to raise millions of dollars online. Having pushed policies like single-payer health care and free public college tuition into the Democratic mainstream, Mr. Sanders could be a powerful competitor for the nomination — and a daunting obstacle to Ms. Warren and other economic populists. That said, "many in the party are skeptical that a fiery activist in his eighth decade would have broad enough appeal to oust Mr. Trump." Joe Biden, 75, is "not committed to running," but will still be campaigning this fall for up to four days a week afer labor day, according to people familiar with his strategy. So far Biden has "struck a gentler chord" than Sanders and Warren, more calmly suggesting that Democrats need to rise above Trump's taunts. Mr. Biden, who has run for president twice before, has been seeking out a younger cohort of Democrats: During a trip to New Orleans in June he arranged a visit with Representative Cedric Richmond, the 44-year-old chairman of the Congressional Black Caucus, and this month he will travel to Arizona to help Representative Kyrsten Sinema, the Democrats’ 41-year-old Senate candidate, and to address a gathering of the Latino advocacy group Lulac. Biden is trying to gather support and install allies in key states, such as South Carolina. “The vice president has a lot of long and deep relationships in South Carolina, and they’re substantive relationships,” said Steve Benjamin, Democratic Mayor of Columbia, South Carolina's capital. Biden, according to the Times, realizes that his party is drifting from his institutionalist style and relative moderation, according to people who have spoken with him. He's thrown support behind two possible presidential candidates for 2020; Mayor Eric Garcetti of Los Angeles and Governor Steve Bullock of Montana - both of whom he advised to make their 2020 decisions without concern for his own. Then there's Kamala Harris and Cory Booker - the two younger democrats in the 2020 vanguard. The two younger Democrats in the 2020 vanguard have been campaigning for fellow senators, and at times intervening in contested primaries to support like-minded candidates. Both also sit on the Senate Judiciary Committee — the panel that will scrutinize Judge Brett M. Kavanaugh, Mr. Trump’s Supreme Court nominee, in the coming months — giving them a high-profile platform to challenge the president. That said, Democrats expect many other candidates to emerge, "unless the midterms become a chilling disappointment." 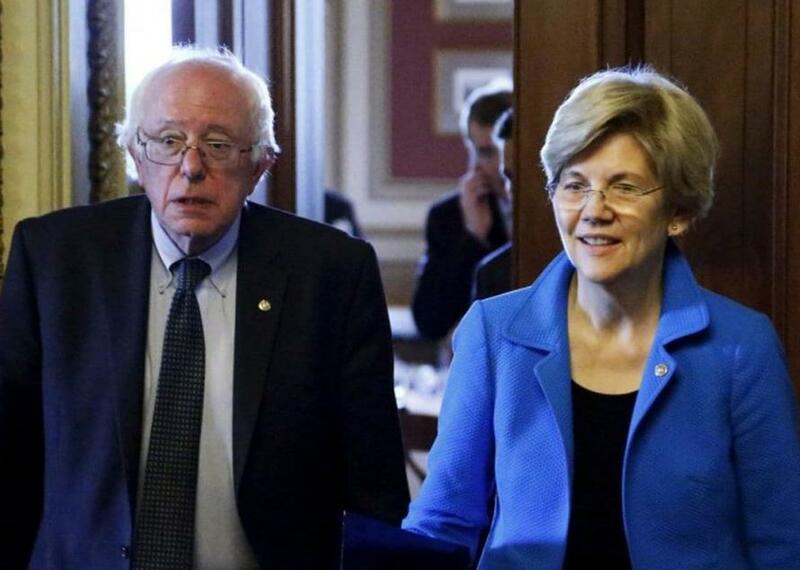 In short; Democrats are likely looking at Warren, Biden or Sanders for a 2020 run - but without a phenom like Barack Obama, they may need to wait until 2024 to take another bite at the apple.